Campeggio La Viorna si trova a Potes, Cantabria. Il campeggio a terrazze dispone di piazzole delimitate, sia ombreggiate che e piazzole poco ombreggiate. È possibile affittare chalet. Il campeggio dispone di un parco giochi. Per gli sportivi, il campeggio prevede un programma di escursioni, passeggiate con accompagnatore e diversi percorsi in bicicletta. Il campeggio dispone di una piscina scoperta e una vasca per i più piccoli. Non è sempre necessario cucinare, perché all’interno del campeggio ci sono ristorante con menù poche portate e ristorante con ampio menù presente. In campeggio è possibile acquistare pane fresco. Potete navigare su Internet, poiché c'è un punto wi-fi. Ogni anno un ispettore visita il Campeggio La Viorna, controllando oltre 200 tra attrezzature e altri punti di interesse del campeggio. L'ispettore è un dipendente ACSI e non lavora per il campeggio. Beautiful place placed at Picos de Europa. Just 20 min from Fuente Dé. Camping has all facilities and cleanfull. Good staff and friendly people. The only thing missing is a beach. The rest is just perfect. Great view to Picos. You can tell how much dedication there is and attension to detail. Very friendly people and quit low prices for pitch, shop and Restaurant. Remarkable clean and practical facilities. Not even smelly toilets but wood essence from the nice traditional building. Great pool for little kids (0.5m). Nice walk to Potes or mountains apart from traffic. A sink and toilet for kids would be great. A minus for having unsecured falling hazards for smaller kids in frequent places. But finally: The best site we stayed this year out of of well over 20. One review said this was the best camp-site in Spain. I haven’t been to them all, but this is the best camp-site I have ever use in 55 years of camping. We stayed back on June and the scenery, service and facilities were all top class. We think this is a fantastic campsite. Very clean and lovely hot showers. The site is well situated - a nice walk into Potes and the Picos mountains are brilliant. Extremely helpful owners and nice restaurant where we ate twice. We definitely hope to return. The food is great and quite chip, there is a daily menu. The facilities are spotlessly clean. The personal is friendly and speak English. Lovely superbly run campsite in a beautiful location. Owners and staff are great. Spotlessly clean facilities. Fantastic site and surrounding area with beautiful views of the Picos Mountains. Swimming pool was very cold. Excellent staff. Ideal for reasonably active people. A return visit is definitely planned. If you're towing a caravan and unsure of your towing capabilities then the road in and out of Potes is not for the faint hearted. Brilliant site in glorious surroundings. Excellent and clean facilities with varying sizes of pitch. Staff are great, always available and helpful. The food in the restaurant could be a little more ambitious but you have the medieval town of Potes a short distance away with lots of eateries and bars. Many people return to this site, it's one of the best. An extremely well organised and run campsite at the heart of the Picos de Europa. Terraced grass pitches, the site surrounded by stunning mountain scenery. We did not use the restaurant but it was very popular. The site about a mile from the historic, interesting town of Potes. Good walking area and an excellent teleferica (cableway) to Fuente Dé within 15 miles. Volete prenotare il campeggio Campeggio La Viorna o oppure saperne di più? Potete farlo usando i seguenti dati oppure tramite il sito del campeggio. Un km dopo Potes in direzione Fuente Dé, poi a sinistra verso Santo Toribio. 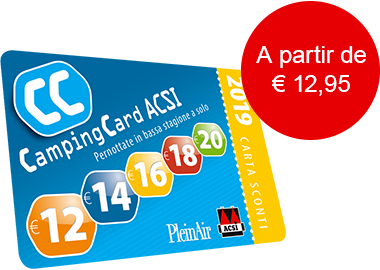 ACSI Eurocampings invia la tua richiesta di informazioni al "Campeggio La Viorna".